The Streamline captured the classic lines of the traditional soda syphon. 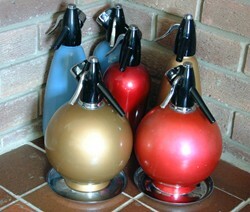 There is a hint of Art Deco in this 1940s style Streamline Syphon pictured right. The hammered finish was a feature of early versions of this design. Streamlines were also sprayed in familiar reds, golds, and blues. A chrome version with red or black stripes added a touch of glamour. The Sparklets Hostmaster is the soda syphon most people are familiar with. Its profile suggested up to the minute modernity in the 60s. Used as a prop in many 70s dramas ensured it became it became a symbol of 70s kitsch. In the 70s, Sparklets gave the Hostmaster a new look with different patterns, circles and abstract shapes. The Globemaster was the ultimate party soda syphon. It took two sparklets bulbs, so it would last twice as long without a refill. The Globemaster was the most expensive soda syphon in the range. Its ball shape fitted in well with a modern house. 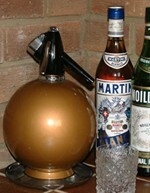 The growth of sales of beer in party containers, such as the Watney's Party Seven, prompted a new use for the Sparklets bulb. It could now be used to produced draught beer on tap. The device was originally partnered with Davenports for their Drum Bitter, but was soon available from Watneys for the ubiquitous Party Seven. www.easyontheeye.net/soda/index.htm has a description of the Sparklets range. You can buy bulbs for Soda Syphons. These ISI, right, are available on Amazon. Translation from Dutch to English (thanks to Google): BOC have a number spray water syphons but do not know exactly how they work. Have a go with the cartridge of the spray whipped cream. Fits but also gives a very 'hiss' sound, but does nothing. Can the patterns of spray whipped cream (Tefal) also use the BOC sisphons? The holder fits so well. someone has a picture of a Paton / cylinder holder of a BOC, serial. SHUV? "Hi i have an old syphone with wire & the pin is missing..no puncture! Is it possible to replace ..or even buy a complete top replacement mechanism .? "It is probably the rubber seal at the top. I'm not sure if you can get spares now. "I have a Vintage SYPHOLUX Soda Siphon bottle complete with spare gas cartridges and cartridge holder. "I have a mesh Usa 1930s glass siphon SCG/PDP-WM ish. "I have a 1.8l Sypholux which needs to be repaired. I live in Johannesburg, South Africa. Do you know whether there is an agent here that could assist? both "globemaster and other types of syphon. where can I purchase seals,washers,tubes and other spares bearing in mind the age of these items.